So far Rees Roggenstein has created 44 blog entries. Junior, Rees Roggenstein, expresses his thoughts on journalism and urges other to celebrate Scholastic Journalism Week. Journalism or publication classes in a nutshell teach students to write articles, publish them and do a small amount of social media promotion. On the surface journalism prepares people for work in the media. But beneath the surface, beneath this shallow idea of journalists, there is a wealth of practical and applicable knowledge beyond what other classes could possibly teach. To those who are patient and respect the process of reputable journalism, the benefits could almost be endless. Even on the surface the skills this class teaches is incredibly useful, and on a deeper level journalism can expand one’s perspective. Producing articles results in better writing skills, conducting interviews improves basic conversation skills, and working with media and social media is now necessary in most colleges and businesses. Even on the most basic surface journalism is still useful for equipping people for the real world. On a deeper level this class still has much to offer. It can expand one’s limited perspectives; publications classes require reporters or guest writers to visit places and talk to people they otherwise would never know. The opportunity to get outside my comfort zone, to interview people, to observe, and to learn from others is a lifeskill. For me, it expands my horizons and opened doors I did not think could be opened. Journalism enriches my high school career in ways other classes have not done yet. More specifically, The Feather shows me things I did not think I would see and helps me build relationships with people I will remember for a long time. The people on The Feather staff teach me how to think for myself, to articulate my opinions, and to look at all perspectives of a topic to find the whole truth. These are gifts one cannot put a monetary value on. So to those who have an opinion they want to share, to those who want to report the truth, to those who want to express themselves to the world, come join with journalists this Scholastic Journalism Week. Come and celebrate our right to freedom of speech, come and celebrate the ability to express ourselves, and come and celebrate the journalists for embodying this liberty. Follow The Feather via Twitter @thefeather, Instagram @thefeatheronline and Facebook @thefeatheronline.This writer can be reached via Twitter: @RRoggenstein. For more opinions, read the Feb. 22 article, COLLEGE CORNER: College Placement Tests. Teachers and students from the FC community gather to help and aid the city and county of Fresno. Serve Day is almost upon us, and with it many opportunities for service and fun. From sorting food at the community food bank, to cleaning neighborhood parks, the students will trek off into Fresno to aide those in need. This year Serve Day will be held on Feb. 19. Staff and students will be going to the Poverello House, Community Food Bank, Kepler Neighborhood School, Ted C Wills Community and the Neighborhood Thrift Store. After chapel most of the student body will break up into groups and travel by bus to southwest Fresno to serve at these locations. Leadership Advisor Robert Foshee, describes the conception behind serve day and how it can effect perception. Secretary Brenda Warkentin explains the significance Serve Day can have on students and the purpose the school has for this event. Senior Kim Ward, expresses her enjoyment in participating in last year’s Serve Day. Jeremy Brown, Superintendent, believes that Serve Day is important to the students because it can expose them to a new way of thinking. With #RAKweek2015 (Random Act of Kindness week) coming to a close, remember the personal promises made as individuals chose to participate. Now, the school will come together as community for #FCServes2015, and carry the thought of selfless kindness. Students will leave around or just before 10 a.m., and return to campus no later than 3 p.m. A map can be found at https://www.google.com/maps/d/viewer. The Community Food Bank location has been changed to 3403 E Central Ave.
Only students who cannot participate are required to bring a reverse permission slip. Parents should sign this if their student will not participate in Serve Day 2015 and need to remain on campus. Students who decide to participate are encouraged to wear clothing that they can get dirty in or get paint on. This is not an event to look their best. Make-up is not required. The Feather staff encourages readers to take photos and use them in the Instagram and Twitter posts to document peer volunteerism using #FCServe2015. 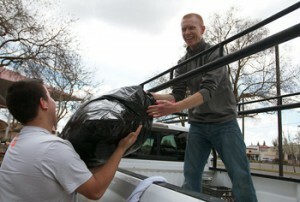 For more news, read the Feb. 17 article, FC community invited to aid Community Food Bank, Feb.21. In a world of duality, people are capable of great good and great evil. With one hand we reach out claiming we want to aid our brother, but with the other hand we are tempted smack him. Good and evil: the dual nature of man and the constant struggle he has between to the two. Service epitomizes the good in people; it is humanity’s goodwill incarnate. People sacrificing time, effort and resources for another group of people with no promise of a reward, or even recognition. Service is essentially altruism in practice: the principle or practice of unselfish concern for others. A number of psychologists have speculated that true altruism does not exist; even though a person may not receive any monetary reward or public recognition for their service, they still receive personal and emotional satisfaction. Because of this serving could even become selfish. But this claim could be interpreted differently. It could mean that serving has some physical, neurological or emotional reward for those who practice it. Is it not utterly encouraging that science has proven that service truly is its own reward? That we are hotwired to feel gratification and satisfaction for something that we will not be repaid for? Is that not beautiful? Personally, I know the sting of selfishness. When I spend each day only thinking about my own problems and thinking only about my own pleasure, I began to feel like I am sinking. I began to realize my predicament after leaving a party that everyone says was so amazing, but I feel absolutely nothing inside. When people talk about my participation, and how great or how awful an event was, I feel nothing. It became dark, and I felt hallow inside. To fix that hallow feeling, I need to pour myself into others, helping in anyway I can: a kind word, a listening ear, really anything. So I am beginning to realize that service does not only give some emotional reward, but it can also fill a void in my heart with meaning and purpose. So please join me and leave comments below telling how you have served recently. Any random acts of kindness, good deeds, kind words, anything. And as FC’s 2nd annual Serve Day comes Feb. 19; make sure to go out and serve with a full heart. It might be just as a fulfilling for you as it is for the people you are helping. Students will head out at 10 a.m. on buses, and can be expected back on the campus by 3 p.m. Follow The Feather via Twitter @thefeather and Instagram @thefeatheronline. This writer can be reached via Twitter: @RRoggenstein. For more opinions, read the Feb. 6 article, Superintendent speaks: Why FC?. Rees Roggenstein travels to Phoenix, Arizona to attend Super Bowl XLIX. To many American’s, the Super Bowl is the grand championship to one of our nation’s favored sports. A time to witness the two best NFL teams test their mettle and grit for all the glory and prestige that goes to the victor. A spectacular sight that not everyone gets to see in person, but I will be one of those lucky few that see it unfold with my own eyes. It’s Tom Brady versus Russell Wilson. It’s three time champions versus defending champions. Two massive titans, the Patriots and the Seahawks, will face off on the Super Bowl battleground to determine who is the greatest. So as I fly with my family to Phoenix, Arizona, I will take The Feather along with me. I want to give a perspective of what it is like to get the full Super Bowl XLIX experience. All the highs, all the lows, and all the in-betweens. SUPER BLOG POST No. 4, Feb. 2, 2015. With a trip so amazing there had to be some low points during the course of the trip. Of course there were a few obnoxious fans, crazy protestors, and a few drunken idiots that might prove to be mild annoyances. Even the sun, which shined directly in my face for the whole first part of the first quarter was very annoying, but all these were manageable. Except for one. The traffic. The traffic was almost unbearable. It took almost 3 hour to leave the parking lot. I became hot and sticky, my mouth was dry, my phone was dead and I was begging for release. But release would not come for hours, I was truly trapped. But all in all, the Super Bowl experience I had was simply unforgettable. Even suffering through the traffic was well worth it for what I had the extreme pleasure of witnessing. The fans, the sights, and most importantly the game left an impression of extravagant displays of emotion and how to enjoy the little things properly. One might even learn a little about themselves, or about the world them if they took a trip like this. SUPER BLOG POST No. 3, Feb. 1, 2015. I truly underestimated the hustle and bustle on Super Bowl Sunday. As I stood calmly in the hotel lobby waiting for our Prime Sport guide to take us to our shuttle; a rude suit appeared from the shadows howling “Clear the way!”. He then proceeded to forcibly shove me and my family and our own attendant out of the way. Hopefully the game is not full of these suits. The activity at Westgate, directly outside the Super Bowl stadium was insurmountable. The people were countless, almost like a swarm of ants all bunched up together. People were pushing and shoving each other out of the way to make room simply to move. Taking advantage of the situation, a number of sports bars in the area demanded an entrance fee. The highest fee, which is just for entrance not drinks, was $1,000. Now if you want drinks that’s a total of $3,000. That was very sneaky, but very opportunistic. As we started making our way towards the stadium I noticed a number different things about the people. First being that the Seahawks fans were more creative in their costumes and dress than the Patriots. Blue and green mohawks, face paint, body paint, crazy hats with long green hair poking up from the top could be seen almost everywhere. They are very devoted to their team. The second thing I noticed were these church folk that took the streets speaking of the end times. They chanted end time scriptures and handed out pamphlets detailing what heaven will look like, and that science has discovered that “pure gold looks like blood red”. I was unsure if I was being condemned to hell or if they were inviting me to a church service. As I entered the stadium I felt very small. The sheer size of the stadium is enough to make a person feel small, but the amount of people rushing and dashing past me made me feel even smaller. A big stadium, big people, and big lights make for a grand experience that could leave one feeling bewildered. The fans were truly a sight to behold, they were just as fiery and explosive as the game itself. Patriots and Seahawks were intermixed, they were cramped together with close seats, and their blood-alcohol level was more than likely over the legal limit. Some fans were fiery and quick to burst at mild grievances, screaming and yelling if someone in front of them decided to stand while they wanted to sit. But others took calmer approaches, and even decided to make conversation with people rooting for the other team. Though the fans did have their differences; there were a couple of unifying factors. Namely the half time show hosted by Katy Perry. The stadium sparkled in red, white, and blue lights as the Super Bowl attendees flashed their LAD lights. The stadium itself was a spectacular sight, but all who witnessed Katy Perry ride a flying star as fireworks went off around the area dropped their jaws. All were unified, even if it was only for a brief moment, under Katy’s extravagant performance. More jaw-dropping than Katy Perry’s show was the last few minutes of the game. One moment the Seahawks had the lead, than it shifted to the Patriots, than the Seahawks were a few yards away to getting a touchdown to win the game only to get the ball intercepted. As the ball was passed the hopes of the Seahawks were dashed. With the Super Bowl won 28-24, the Patriots were louder and more fiery than ever, but the Seahawks were quiet; almost silent. Even though there can only be one victor, both sides seamed to agree that this game was one for the ages. Stay tuned for posts throughout the next couple of days. Waking up at an hour before 12 in the afternoon is no easy task for most teenagers, and it is almost considered taboo or unholy on weekends. But oh, how sweet it was to hear my alarm clock chime that electrical ring directly into my ear drum in the early morning, because that meant Super Bowl adventure was about to start. Getting ready to travel on the day before the Super Bowl was a more difficult task than I thought it would have been. I was given a total of 10 minutes to get ready and about another 5 minutes to get out the door and into the car to make it to our flight. I didn’t even get to eat in my own house. However, my family made up for that by getting StarBucks inside the airport. And as I sipped on that bitter-sweet nectar from the divines; I knew that I now had the energy to get through the next few hours of travel on a cramped plane. As the plane started its descent, I could see the downtown portion of Phoenix flooded in festivities. Flooded may seem like an exaggeration, but is is really the only way to describe the tremendous amount activity going on in those streets. When we began leaving the airport itself I could see a sea of blue and green, Seahawk fans suddenly emerged from almost every conceivable direction. Men, women, adults, children; all of them wore the same blue and green, I thought I was in a flash mob for a moment. The Seattle Seahawks should be proud of the devotion they inspired in the people I witnessed today. 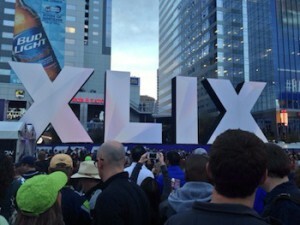 Perhaps the most interesting thing to see though was the amount of advertisement for the Super Bowl. Every corner had some sign with some ticket offer or package for the event. I expected commercialism, but to see it on this scale was truly something amazing to see. And some of the Seahawk pre Super Bowl parties at the hotel I am staying at (Westin Villas) were, in a way, jaw dropping. The chocolate cakes with gushing fudge, the guitarist with golden vocal chords singing slow rock, the bright green and blue lights reflecting over mirrors and water is truly a sight to behold. To think this will pale in comparison to the parties tomorrow. As to be expected, there were some minor complications in the travel plans. My flight on Friday night to go to Phoenix, Arizona, was cancelled. As I read “cancelled” go across the flight monitor, my heart dropped and thought that my Super Bowl experience was over before it even began. But like a warm ray of sunshine, my dad came in and was able to get another flight out of Fresno on Saturday morning. “The story isn’t over until the fat lady sings.” I hope that everything goes as planned tomorrow and that this trip will end with me and my family getting to enjoy the Super Bowl. For more Feather opinions, read Aaron DeWolf’s Jan. 30 article, World of Sports: Super Bowl XLIX. This writer can be reached via Twitter: @RRoggenstein. Follow The Feather via Twitter: @thefeather and on Instagram: @TheFeatherOnline. People often make promises to themselves in the heat of the moment; making vain and empty attempts to change themselves. But when push comes to shove and action is required the interest in the promise wains and the body and mind become lax and unwilling. New Years resolutions provide an excellent example of unkept promises and goals. The interest and determination in resolving ones problems simply fades into the recesses of the mind as time marches on ever forward. Statistically; about 45% of Americans usually make New Years resolutions. Promising to usually lose weight, improve their livelihood, or change their personal and social lives. Only about 8% of these people are actually successful in their endeavors. I often find myself laughing and making fun of these people for making promises to themselves that I know they will not keep, but I too am guilty of almost the same crime. While I do not publicly pronounce my desire to make changes in my own life; I do think to myself quietly how I should improve. I know that my life can be improved, and I often know how to go about making it better, but when it comes down to actually performing I just lose interest. The key to achieving success in these endeavors is in short commitment, perseverance and tenacity. Pushing through, the art of never giving up. The late Stuart Scott is a prime example of this. He was only able to become one of the big shots on the ESPN network due to his own ability and sheer tenacity to draw people in. Mr. Scott is a testament towards hard work and perseverance. The Feather has also had a history of persistence through hard times, but also failures when our determination was needed the most. For us to truly succeed we must not let our goals slip away from us; we cannot lose focus as we have before. With the new school year beginning and we return to our daily routines; we should remember to give our all from the start. It might be hard; it might exhaust us, but we must persevere. If we do not we can fall through; we can lose track of our goals. Always persevere and never forget your priorities. As the law of inertia states; a body in motion stays in motion, and a body in rest stays in rest. It is easy to become lax and easy going over the period of a long break; to fall into the trap of inertia. But in order to succeed; to break this habit; we must stay in motion. We must not lose sight of the gold; we must constantly move forward no matter how hard gravity pulls us down. We must always persevere; we must push through. This writer can be reached via Twitter: @RRoggenstein. For more opinions, read the Jan. 16 article, EDITORIAL: Respecting the boundaries of free speech. Junior, Rees Roggenstein, posts political opinions recent world events. Charlie Hebdo, a controversial French magazine based in Paris was attacked on Jan. 7, 2015, by a group of Muslim extremists. The attack is speculated to be a response to an offensive cartoon of the Prophet Muhammad that the magazine released to the public. Charlie Hebdo has a history of attacking a number of different political and religious groups with their satire; they were also fire bombed by Muslim extremists in 2011 for similar reasons. Though the magazine and the people of France have the right to freedom of speech, and that right is to be protected, does it validate or excuse Charlie Hebdo’s crass behavior and the violence they incited? No. Freedom comes with responsibility, there is a consequence for the choices each of us make. Freedom without responsibility does not exist, and neither do actions without consequences. People living in our modern society seemed to have forgotten what freedom is and how it should be practiced. Freedom is now defined as a lack of barriers or lack of restriction. Freedom should be defined by working within standard and fair restrictions that we impose on ourselves. Freedom should always be tempered with self-control and wisdom. Just because you can, does not mean you should. Freedom without logic, humanity and decency is quite simply destructive. That concept endangers lives, as we have just witnessed with the destruction wrought in Paris. Charlie Hebdo abused its freedom of speech to antagonize and incite a group of people, and the terrorists abused their freedom of choice and took the lives of innocents. As our ability to know the world and interact with it increases we become more susceptible to outside influences. We must maintain level heads and know the boundaries that we should not cross. The Parisien terrorist attack perpetrated by the extremists is inexcusable. These mens’ actions and thought process cannot be justified or understood. Though we should all strive to understand and be tolerant of others and their beliefs; we should also practice self-control and not burst into a rage when someone disagrees with us or even mocks us for own beliefs. These men have not been oppressed; they are not victims of circumstance. They are simply narrow-minded murderers, and should pay the price necessary for the blood they spilt. As students we should learn now that just because we have certain freedoms does not mean we should abuse them. If we start abusing our liberties we could either lose them, or suffer worse consequences. The line between exercising our rights and abusing them is sometimes hard to distinguish, but as a template just remember to act wisely, modestly and respectfully. We do not need to be grotesque, offensive or violent and we never have to stoop to the level of a fool. Just because you can, does not mean you should. For more opinions, read the Jan. 9 article, COLUMN: Steamboat Springs, Colorado: Winter sport wonderland. The riots in Ferguson had shocked the country with their violence. Buildings were burnt, cars were totaled, and many goods had been stolen. What did these things accomplish? The protestors seemed to think that this would bring about their goal of justice. The martyr of their cause was Michael Brown. He was assaulted by a police officer after robbing a convenience store. The protestors made it out to be a racial crime. There’s no argument from me about the police overstepping their bounds from time to time. But no amount of violence will change the fact that Michael Brown is dead and his family is grieving. No amount of burnt out cars will affect change in the police force. Martin Luther King Jr. proved that the best way to change a nation is through non-violent displays. Likely these protestors think that they are of the same mold as King, while in fact they are exactly what he hated. The only thing these protestors achieved was destroying their legitimacy by committing more and more crimes on top of what the police or Michael Brown might have done. They have only succeeded in making the country erupt into hostility. This has never helped swing the public opinion and never will. For more opinions make sure to read the Dec. 12 editorial A Time of Restoration. The Best Christmas Pageant Ever fell short as it was performed at The 2nd Space Theatre. Though The Best Christmas Pageant Ever seems to be an appropriate thing to observe during the holidays, given its Christmas play. However this performance ultimately disappointed and fell short in comparison to other Christmas themed performances. The $15 fee and the hour and a half entertainment are not worth the money or the time. The story follows Grace Bradely (played by Liz Stoeckel) the typical, judgmental, church lady who gets asked to do some convoluted duty at the last minute during the holidays. I watched, unpleasantly, as her struggles with having to put on the Christmas pageant began to crumble down around her. As she scrambles to pick up the pieces left by her predecessor the townsfolk and churchgoers look down on her and believe she will utterly fail. And as our good church lady slowly succumbs to the stress, a group of savage children, named the Herdmans, hijack the pageant and take all the lead roles threatening to make the already failing pageant a complete disaster. The characters were, for the most part, unlikeable. The church attendees and Christians were the typical self-righteous, pious, hypocritical people that they are accused of being in the real world. The characters felt pretentious, condescending, and not at all enjoyable to watch. The only characters that deviated from this hypocritical and condescending attitude were the Herdmans, but their character portrayal was just as hard to watch as the pious Christians. These heathens were overall lacking in intelligence, mean, crude, and again just unlikeable characters. The 2nd Space where the play was held was incredibly small and cramped. The seats were a step up from the plastic ones provided at local high schools. And the lighting would sometimes shine directly into my eye blurring my vision. This venue simply lacked in most categories. Perhaps someone who enjoys close company and bright lights would find it enjoyable. The actors must be commended for the portrayals of their characters. The characters felt real, I felt for them. Though the emotions were not good ones for the most part, I still felt and felt vested in the characters and watching their story unravel before my eyes. Actors must make their audience feel, though sometimes that feeling may be disdain or even hatred, they must make them feel. And these actors fulfilled that task, bravo. Kenzie Stafford played her role as Gladys Herdman amazingly well and provided enough comedic relief to make the other characters bearable. My advice to make the play more enjoyable would be to give this actor more screen time. Though the overall plot felt unoriginal from other Christmas stories, the actors performed exceptionally well given the circumstances and the unlikeable characters they had to play. Even though I did not personally like the play, they made me feel something; they made it memorable at the very least. You may like it, you may hate it, but you will remember it for a while. The play began on Nov. 1 and will continue until Dec. 21. 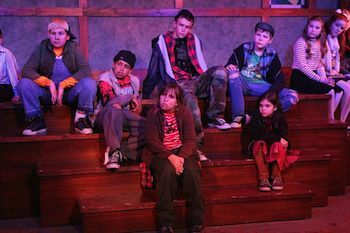 For more information on Good Company Plays, visit their website at http://gcplayers.com/. For more reviews, read the Dec. 2 article, Third film in franchise raises expectations for final installment. Civics classes are taken to the Fresno Court House by teacher Robert Foshee to see trials in session. 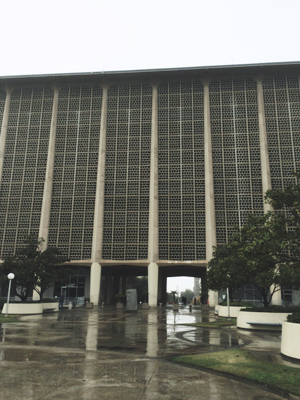 In order to enrich the experience of the FC civics students, teacher, Robert Foshee, took two classes downtown to visit the Fresno County Courthouse, Nov. 13. Students were taken from their 5th period class and departed from the campus at around 8:30 a.m. The classes arrived at the courthouse around 9 a.m. All students had to pass through security, which required them to remove any metal from their person and pass through a detector. Once through, students walked up seven flights of stairs to reach the courts they were scheduled to observe. In light of the recent Mock Trial in the civics classes, the field trip was designed to show students how actual court proceedings are handled. Foshee explains that a hands on experience provides a better perspective of the real world than listening to a lecture about it in a classroom. As students walked into the first courtroom, the proceedings had already gone underway. Everyone had to remain silent and keep their phones out of sight and completely silenced. If this law was violated a fine could be administered and the phone could be taken for an indefinite amount of time. After listening to the deliberations for an hour, the bailiff told the students they may listen to a different case occurring a few doors down. The students were split about in half, with one group staying behind with Foshee and the other leaving with Don Rojeski. Junior, Emily Gonzales, began to doze off during the court case. She did not feel it was worth the time to get there. The civics classes departed the Courthouse around 11 a.m. and arrived back at campus by 11:30 a.m. Although the students did not get to participate in the court proceedings as they were allowed to last year, observing the court proceedings gave students a different perspective on how to conduct themselves during a trial. It was made abundantly clear that the law and how it is administered is no laughing or joking matter. Senior Nick Fontes said he enjoyed his first trip to the court house. He believes it has helped him learn more about how our government systems works. Follow The Feather via Twitter @thefeather, Instagram @thefeatheronline and Facebook @thefeatheronline. These writers can be reached via Twitter: @RRoggenstein and @KevinGarcha. For more features, read the Nov. 13 article, Humble beginnings inspire sweet success. Opinions editor, Rees Roggenstein, comments on the horror that Jaylen Fryberg caused. To America’s great dismay, yet another school shooting has occurred. However, this time there is a disturbing difference in the culprit, compared to the typical school shooter. The gunman was Jaylen Fryberg, a freshman at Marysville Pilchuck High School in Marysville Washingon. Fryberg entered the school cafeteria, pulled a gun out, and began firing, Oct. 24. The day before he opened fire in the cafeteria, Fryberg texted his friends to meet and sit with him at the lunch tables. When they had all gathered together at a lunch table, Fryberg revealed himself and his .40-caliber Beretta handgun and then fired at least eight shots at his so-called friends. As he was shooting, witnesses said he had a “cold” look in his eye, and that he “stared” at the individuals as he shot them. When his rampage was complete, Fryberg turned the gun on himself and ended his life. The strange thing about this particular shooting is that this was not a seemingly disturbed individual. He was not a person suffering from extreme depression, not a victim of bullying and isolation but a student who appeared normal and healthy. And that is what makes this so bizarre, the lack of a significant motive for such horrific carnage. Fryberg was an up and coming freshman at his high school. He was popular, being elected a prince during homecoming. He was athletic, playing an important role for his football team. Not only that, but he also had a family and a community that loved him dearly. His descent into violence shocked all parties. A recent breakup with his long time girlfriend was pointed to as a cause for Fryberg’s massacre, but most people do not go shoot up a school to vent their romantic frustrations. The implications of this shooting are vast. Perhaps the greatest amongst recent shootings. It shows that every person is capable of great evil. But people are also capable of good. Fryberg had forgotten that, but we, the people, cannot forget. We must remember the pain and the suffering so that we can learn from it. We must remember the love and the joy, so that we can give that back to the newer generations. Past iniquities influence the future. We cannot forget. If we do, everything around will fall apart. Everything we built, our forefathers built, our ancestors built will crumble. We cannot forget the darkness and light of humanity, our capacity for great evil and great good. We must never forget. For more columns, read the Oct. 27 article, COLUMN: Be a spirited participant at homecoming. As a homecoming tradition, Student Leadership plans a different dress up day for the week leading up to the game, Oct. 31. This year’s theme, “A walk down Hollywood Blvd,” coordinates with each day’s specific category. This feature will be updated daily to highlight that day’s costumes and attire. Monday will be ‘Merica Monday, where students will dress in all their patriotic garb. Tuesday is set as Tacky Tourist Tuesday where anything you would when you go on vacation. Wednesday will be Wake up Wednesday, allowing students to wake up and wear their pajamas to school. Think A-like Thursday encouraging students to match up with their “Look a-like.” Friday will be the traditional Spirit day where school colors should be worn for the 30th annual FC homecoming. Check back each day for more information as the week progresses as well as more photos to the slideshow available at the bottom of each section. Twins, doppelgangers and copycats walk through the campus on today?s homecoming dress up day, Think-Alike-Thursday. Students donned a variety of different outfits; from dressy to silly, all mediums of fashion were game this day. Senior Joseph Lange, dressed up in a tuxedo morph suit with his triplets Andrew Hindes, ’15 and Adam Khouzam, ’15. Julianna Rosik, ?16, enjoyed the opportunity to express friendship through a creative dress up. Matt Eli, ?15, was not able to participate in todays Think-Alike-Thursday due to time issues. Devin Jakusz, ?15, teamed with Kathryn Damschen in order to enjoy their last homecoming for their senior year. Josh Villa, freshman, took advantage of the opportunity with Ethan Andrew, ’16, to express their stranger sides. Daniel Ayres, sophomore, decided to take a unique approach to dressing up on Think-Alike-Thursday. Sierra Duffy, ?16, allegedly forced her friend, Emily Gonzales, ’16, to participate in today?s dress up event. Tomorrow is Fly-Together Friday. Students can earn points for their class if they dress up in spirit wear. A rally will be held at the end of the school day to promote homecoming and the game, Oct. 31. For more features, read the Oct. 23 article, Seniors strive to wrangle a win. Hobb’s Grove is an annual Halloween event that locals attend for frightening entertainment. Hobb’s Grove, a notorious haunted house and fright fest near Sanger managed live up to its reputation. Never having gone to Hobb’s Grove before, I walked in skeptical not fully expecting what was to come. Needless to say, the night was very satisfying. Having arrived at around 6 p.m., the sun began to recede and dusk began to fall on the farm. The trees became twisted and indistinguishable, the grounds black and obscure, and then the fog settled. Dim lights and fire pits were lit to help illuminate the resting areas, providing an eerie and unsettling atmosphere. And that was just the start of the evening. Attending with a group of friends, we decided to eat first before we lost our appetites during the “festivities”. Food was provided at a number of different stands. People could purchase hot dogs, cotton candy, burgers and soft drinks, along with all of the trademark carnival foods. As we enjoyed our food a number of the staff approached us. All of them donned some kind of sick or demented costume, but underneath each of them were friendly individuals who just wanted to make small talk with customers. The phrase, “don?t judge a book by its cover,” came to mind when I thought back on some of the staff members working there. After we finished our meal and it was dark enough, we decided to go on the Hayride. Apparently this attraction was the most popular, since there was about a 40-minute wait in the line. However, the ride itself made up for the wait. The ride started out smooth enough, relaxing at first actually. But then they started to show themselves. They stayed far away at first, in the fields. They were just silhouettes, shadows in the dark of the night. But they got closer, and closer, and closer until they eventually reached the sides of the tractor. Zombies and ghost nurses, or very realistic costumes of zombies and ghost nurses, began to terrorize the people on board. Not bad, I thought to myself. If only I knew that was just the start. The ride accelerated, moving faster than it did before. Soon we arrived at a slaughterhouse where fire sprayed from some kind of pipe and shot out into the night sky, revealing the masked figures and dangling bodies from the top of the rails. The sight of this evoked memories of Texas Chainsaw Massacre. After the ride finished we decided to rush over to The Forest. My friends said it was some kind of maze, but that was all they told me before we entered. They lied of course. The Forest had one path, and there was no turning back. Ghouls, zombies, chainsaw wielding psychopaths, and worst of all, clowns, chased as us as we ran through this demented trail. To top it off, a hand grabbed my ankle from the ground. As I looked down a sickening looking woman convulsed on the ground, I promptly felt the urge to leave and bolted. However, a tree branch caught the back of my hoodie and against my urges to move forward, could not. In fact I had to walk back towards creepy demon possessed convulsing on the floor lady in order to unsnag myself. After calming down, we went to the very last attraction: The House. Starting off, we are each given a pair of 3D glasses. Upon entering the house, a number of optical illusions and psychedelic feelings took over. Disorientation soon set in, and I was glad to take them off as we left the first section. However, that was not the end of this horror house. Behind every corner was some creature, behind each shadow something lurking, every room sent bristles down my arms and shivers down my spine. The black room, one devoid of any light, was truly terrifying. No sight was awarded to those who entered, except for the shining reflection of a small knife in a white hand that walked closer and closer. Too someone who enjoys horror movie and a good scare, this one room legitimately frightened me. Of course there is more to this place than a few jump-scares and creepy settings, but to go into any more detail would spoil the whole thing. All the rides and attractions at Hobb?s Grove are best enjoyed with an element of surprise, and I would not want to ruin all the fun. 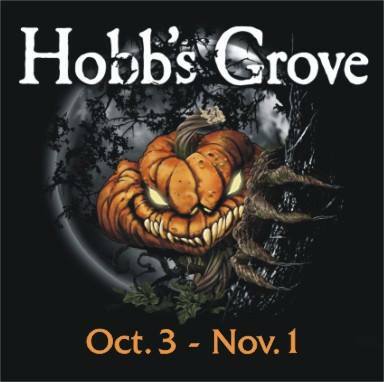 Hobb’s Grove ends on Nov. 1, so make sure to visit while you can if you enjoy a good scare. Make sure to visit their website at http://www.hobbsgrove.com/ for ticket sales and opening hours. Tickets cost about $30 to visit all of the attractions. Hobb’s Grove’s address is 14265 E Goodfellow Ave, Sanger, CA 93657. Hobb’s Grove also hosts weddings and other events when halloween is out of season. Follow The Feather via Twitter: @thefeather. This writer can be reached via Twitter: @RRoggenstein. Rees Roggenstein, opinions editor, warns of potential Ebola outbreak in the United States. Ebola, once a far away concern to the US and her citizens has finally managed to breach the walls of the nation and infect the citizens. Thomas Eric Duncan, or “Patient Zero” was the first person to bring the virus to the States. Though the local Dallas hospital attempted to save his life, he eventually succumbed to the disease. Not before he infected a nurse that attended to him, becoming the first case of Ebola being transmitted and contracted in America. Recent media coverage of the potential outbreak has been criticized for exasperating the situation, however, that simply is not the case. Though there is only one live patient for the disease in the States, the potential devastation that they pose is massive. Ebola has an incubation period of 2 to 21 days, hosts may be infected and exhibit no symptoms during this time. The virus itself is highly infectious, being able to transmit itself through bodily fluids such as: blood, saliva and mucus. Cross species contamination is possible, meaning animals can transfer the disease to humans, visa versa. Even corpses remain infected for a number of days. The mortality rate for Ebola is above 50% without treatment, about 25% with top of the line treatment. Though this disease poses an immediate threat to West African countries, it also poses a potential danger to first world nations if not handled correctly. Current US policy has not upheld a satisfactory containment of the disease. Boarders have not been closed and countries infected with the Ebola virus are still allowed to leave their country boarders and fly on commercial airlines. Proper quarantine procedures have not been upheld. This policy is not sustainable. There are two ways to eradicate a disease. One, find a cure for the disease and administer the cure to all infected organisms. Two, quarantine all infected organisms until the virus kills all of its hosts. Because Ebola has an incubation period of 2 to 21 days, an infected person could leave a country without exhibiting any symptoms, then spread the disease even further. The safest way to deal with Ebola is to shutdown transportation to all infected nations, and all infected citizens should be moved to an isolated area within each country and monitored. “Better safe than sorry” is a welcomed policy in regards to a potential outbreak. Opinions editor, Rees Roggenstein, reflects on the current generations growing apathy towards news and current events. What happens when a person takes something for granted? They lose it. What happens when they take their friends, family, and loved ones for granted? Those relationships begin to fail. Becoming apathetic towards gifts usually results in losing them. What about a person’s rights and liberties? Can these things be lost as well? Yes, if the people are unwilling to stand up for their beliefs and fight for what they have they eventually lose it. Despite knowing this, America’s youth have grown disinterested towards news and their first amendment rights. Disinterest is insidious, but its presence in our society becomes more apparent with each passing day. The younger generations no longer seem to know and no longer seem to care about the affairs of this world. Already they are becoming more and more uninformed, and transforming into empty vessels consumed with their own little worlds, blissfully unaware of their surroundings. Research shows that at least a third of young adults “do not have news in their lives”. The death of printed newspaper, a lack of family conversation during meals, and a general lack of education have all been pointed to as possible causes for these statistics. Regardless of the why, the implications are dire. In order for a modern democracy to operate it requires informed citizens. Democratic society cannot exist if people vote blindly, that foolishness creates disorder and anarchy. If the youth continue to grow up not caring about the news, or their rights, we end up creating a nation of idiots, a nation that will fall. The only way to remedy this growing crisis is to inform the people at younger ages and encourage them to form their own thoughts. Parents should begin talking to their children about the news and ask the kids for their opinions, and teachers should enlighten students to current news events. Already strides are being made to educate the masses on the importance of news and information. News Engagement day stands as a testament to this endeavor, but more can be done to inform the people. Make sure to support journalists and their passion to report the news. Do not take them or their work for granted, because without them modern society could fall apart. For more information on National News Engagement Day, check out Brian William’s Video and KABC Talk Radio. Opinions editor, Rees Roggenstein, urges students and local community to become more involved and grow together. How does a school grow? How does it improve? Where should it even begin? The answer lies in the students and the student body itself. They serve as the foundation of the school, the bedrock, without them it falls apart. Some might say a proper administration takes priority, or massive financial backing, or intelligent staff and teachers. Though these things are important and incredible assets to have, they still cannot create the change a unified and determined student body can. Palo Alto High School and their online daily newspaper, The Paly Voice, demonstrate that the students are the source of change in their school and community. 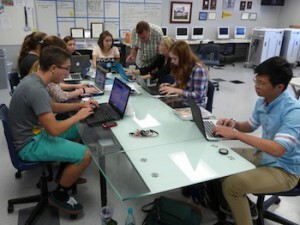 The journalism program at Palo Alto recently received millions of dollars to build a digital media center on their campus. This was brought about by the undeniable excellence of their students, their adviser and a community measure that supported the vision. Through the students’ ability and excellence they were able to raise enough community funds (school bond or otherwise) to finance their new building. Though they raised the funds through the community, that would have been an impossible endeavor without the students showing them their passion. The Paly Voice provides an outlet for the school and community and local areas to become news headlines everywhere. It only takes one part of a community to flourish, and this in turn helps increase the moral and pride for the rest of the city. However, The Paly’s level of fame and excellence can be achieved by other students and other programs, as long as they put forward the necessary excellence. For instance, The Feather itself has won national awards; multiple CSPA Gold Crowns and Pacemakers line the walls of the tiny lab. The Feather created an amazing legacy, a legacy that becomes increasingly harder to surpass each year. And though the staff did not win the NSPA Pacemaker last year, staffers still have the same potential as those who passionately worked before them. I urge The Feather, it’s staff and the campus community to remember its legacy and dig into the untapped potential it possesses. Let’s join together, rally our community to back our school as we compete in academics, sports, music and the arts, and engage with the Feather in campus news. The Feather is back, but we need your help to address issues, cover campus and community activities and support each other. Please consider joining us in this worthy endeavor to tell our story of Fresno Christian in the community. Courtesy of Mr. Gilmore's wife. The Feather Editorial board touch on the subject of coping with the death of loved ones after the passing of community member and coach Ericlee Gilmore. Throughout life, all people taste that sour flavor of loss in some way or another. This loss often leaves a gaping hole, a void so deep that it seems nothing could possibly fill the what was left there. And sometimes, that void, that hole, can never be filled. 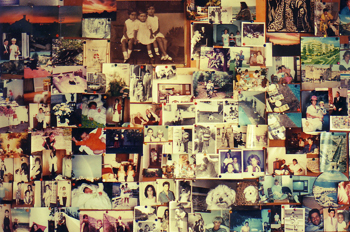 The loss of things and possessions can be coped with easily, but what about relationships? What of our friends, our family, and our loved ones? These people cannot be replaced with someone else; their place cannot be filled with another. They touch and shape our lives in their own unique way, and the hole they leave when they are gone sometimes seems too great to live with. How then do we deal with loss? Is there a secret remedy to cure it? Is there a way we can make it stop? No, as long as we love we will always feel loss. Should we then get rid of love to make the hurt stop? No, without love there is no life and nothing worth living for. “Better to have loved and lost then to have never loved at all.” That old cliche rings some truth in its words. What quality of life would we, as human beings, live without love? Though the pain of loss seems too great to deal with, that pain eventually subsides. And when it does, the memory of the person becomes a sweet delight. Those bitter tears that roll down our cheeks eventually become tears of joy because the lost become a cherished memory. Honoring the departed starts as a heavy cross to bear, but the pain does mold into such tender sweetness. The families and students at FC lost a good friend recently. Mr. Gilmore left a hole in the hearts of those he met, and he is sorely missed. Though his passing is a bitter pill to swallow, let us take time to remember all he had done for us. Let us grieve, but let us also cherish the memory of Mr. Ericlee Gilmore. As we go through time of loss, we need to remember that coping with grief is a process that must be faced. Whether you’re retired or just starting out in high school — human beings from all walks of life can relate to the ways we react during grief. Elisabeth Kubler-Ross, psychiatrist during the 1900’s, introduced the 5 stages of grief that all humans go through in order to cope with loss. We start to isolate ourselves and deny that the situation even happened at all. Then, whether rational or not, our mind begins to feel anger. This anger can be directed towards a number of things, depending on the situation. The third stage, bargaining, is when the person begins to hope that somehow they can undo the event or the grief. This stage often involves bargaining with one’s self in hopes of earning a longer, happier life. The next stage, which many are familiar with, is depression. Throughout depression, the griever begins to realize the certainty of loss and question the purpose of life. Often times, living seems like a pointless process to the depressed. The final, most satisfying stage, is acceptance. This is the point where the individual comes to terms with loss. They realize their mortality, and that loss is a healthy part of life. This stage usually stabilizes the grieving, and brings them to a calm phase. Though there is no remedy, no miracle cure for loss, there is a way to accept it. Though the hole can never be filled, it can be learned to live with. The answer is time. With time, that once painful scar becomes a beautiful reminder of the love shared with that person. For more opinions, read the Sept. 19 article, Starting the school year off right. FC concert choir and ensemble travel to Pete DeGroot’s Cabin up at Bass Lake to bond and become “one voice”. For this year’s annual Choir Retreat, choir director, Susan Ainley, took the ensemble and choir classes up to Pete DeGroot’s cabin up at Bass Lake to bond as “one voice”. The groups carpooled up the mountain and traveled back down the next day, starting at 8 a.m., Sept. 13. With a number of new students joining the choir and ensemble teams, this new choir needed a chance to foster bonds between the older and newer members. Andrew Moore, ’16, took swimming in the lake to a new, and perhaps illegal level. Though the swim was long, and his muscles were exhausted for the rest of trip, Moore did not regret his decision to swim across to the other shore. Bailey Brogan, 16, enjoyed the card games and other bonding experiences that marked the experience during the choir trip. 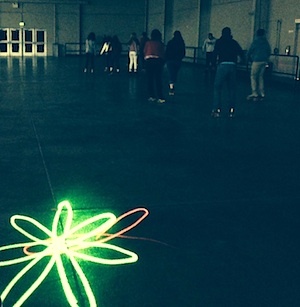 Kim Ward, ’15, liked the trip overall, but became disappointed when plans fell apart. 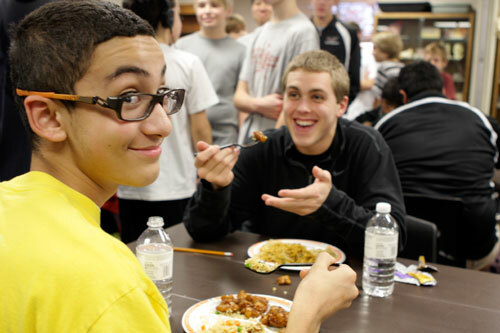 Sophomore, Zach Passmore licks his lips when he recalls the food that was served to the students during the trip. Ainley enjoyed watching new relationships flourish and old friendships grow deeper. Though the trip was designed for fun and bonding among the choir classes, preparation for the upcoming concerts was a priority as well. The first concert is scheduled to for Oct. 6 at 11 p.m. at the GL Johnson chapel. Make sure to attend the concert and support your school choir. Junior Rees Roggenstein recounts his experience at Harvard University and credits his success to The Feather Online’s journalism program. This summer I applied to a summer school program at Harvard University for college credit. The program was extremely hard to get into; only 3,000 students were accepted, and I was fortunate enough to be one of them. I lived in Cambridge for two and a half months, attended class every Monday and Wednesday in William James Hall, and had my first taste of college. I studied Behavioral Psychology under professor Richard McNally with 14 other students. Only a few of the students were in high school, a couple had already graduated from college and took the course to diversify themselves at their work place. 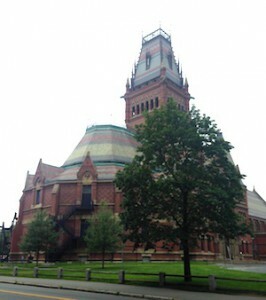 Hard work, sacrifice and endurance marked my studying at Harvard. I had never been challenged academically like this in my entire life. The homework consisted of reading multiple 40-page articles, constantly asking about the material during class hours and presenting PowerPoints, based on the articles we read, in a minimum of 15 minutes. I gained insights into the psychology of people and, as a result, I understand why people do what they do. Information in this area is beyond valuable, but the class offered even more than just that. It also taught students techniques to combat self-control failures, like procrastination and writers-block, applicable tools to the everyday student. I was amazed that I was accepted to this program, even more amazed that I passed the course. But the more I thought, the more it made sense that I was able to compete with the other students. Journalism gave me an edge that they did not posses. The Feather teaches its students the delicate art of presentation, and how to find valuable information and make it applicable. Since my class needed me to create PowerPoints, these skills became invaluable. Without journalism, without The Feather, I could not compete with my classmates at Harvard. Without The Feather I doubt Harvard would have accepted me in the first place. In short, I used my connections with journalism and earned Ivy League education. It took me all the way to summer courses at Harvard; it can do that and more for anyone else who takes it just as seriously. This writer can be reached via Twitter @RRoggenstein. Follow The Feather on Twitter @thefeather. For more opinions, read the Sept. 5 article College Corner: Responisbility begins early. Junior, Rees Roggenstein, urges students to enjoy their school year and speaks to his fulfillment at The Feather Online. I have been attending FC my whole life, ever since kindergarten. That makes me a “lifer”, but I had been ashamed of that since sixth grade up to my sophomore year in high school. This school always had amazing teachers; students, and faculty, but I felt like it was missing something. This great, amazing experience that I should enjoy was missing something vital. Then I found this mysterious missing piece when I joined The Feather my sophomore year. It sounds silly, but that class opened doors to worlds I could have never opened all by myself, I saw the school with a new and refreshed perspective. The places I visited, the people I met, the things I learned enriched my experience to an unreal level. The Feather taught me more than journalism; it taught initiative, perspective and what success should look like. When my sophomore year ended I was finally satisfied with this school; I could graduate fulfilled and unashamed. Now the school is changing, evolving into something greater than what it was. With the school transforming it brings new experiences, new relationships, new perspectives. I cannot wait to see what the school will bring now, and I plan to savor every new experience. The question is, will we change with the school? Now everything in this world has its faults, including our campus. With that in mind, we have two options: sit down and complain about every fault, like a child, or work to make the best of what we have and improve it. I am no better than anybody else; I have complained and whined (like we all have), and not just about the school! But I have learned that if we are not going to do anything about it then we should just keep our mouths shut. What good is it to just complain? Sure things are not great, sure things did not go the way they were planned, but just sitting there and complaining accomplishes nothing. The problem is not seeing the faults in something, the problem is sitting down and doing nothing to change it. So as school begins new experiences are just on the horizon, waiting to be felt. I encourage us all to take part in it, to be a part of something new. Let us enjoy the good, learn from the bad, and then put it towards something of value. No more sitting around, it is time for action. For other opinions, read Aug. 20 article EDITORIAL: Leave a mark. Brother to Brother offers a mentorship program for high schoolers to guide and help junior high boys. In order to foster a mentorship for the young men in junior high, science teacher Terry Richards created and maintained the Brother to Brother club. Richards founded the Brother to Brother program because he noticed a lack of junior high counseling. The club aims to teach the younger generation of men by pairing them with an older companion that will impart their wisdom onto them. Richards believes that this camaraderie is essential to young men. Though the program is designed to mentor, the members also enjoy becoming invested in one another’s lives. Bailey Brogan,’16, fondly remembers mentoring a younger guy, and looks forward to mentoring again this year. Matthew Oliver, freshman, was a younger brother in the program last year and encourages others to join it as well. Brother to Brother will have it’s first official meeting of the year on Aug. 26 in Richard’s room at lunch. This writer can be reached via Twitter: @RRoggenstein. Follow The Feather via Twitter: @thefeather. Two important dates remain for the California Scholastic Federation (CSF): The final meeting held at lunch in room 621, May 14 and the annual senior recognition banquet, May 19. The purpose of the banquet is to honor the students who were able to maintain four semesters of active membership to CSF. The juniors in CSF will be planning the event in conjunction with Michelle Warkentin to make the night as enjoyable as possible. Shannon Martens, junior, is helping plan for the event to honor the seniors and their academic achievements. Michelle Warkentin, the current CSF advisor, has been absent for about a month after delivering her newborn child. She will be returning to help plan for the senior banquet. Seniors wishing to attend the ‘Paris’ themed banquet need to RSVP to Michelle Warkentin by May 14. For more news articles, read May 12 article, BREAKING: Students earn ACSI awards. With the end of the school year approaching, art teacher Sharon Scharf has decided to pass on some useful tips to the students on how to clean those impossible stains. Scharf has decided to help the students take the next step towards independence from their parents by arming them with knowledge on how to clean their own clothes. To learn more about how to effectively remove stains, check out the Clothing Care DVD that Scharf used to educate her class. Junior high student Angelica Escalera enjoys the project because of its helpfulness to students. Junior High student Erin Baudonnet enjoys washing clothes and feels that the project is giving her hands-on preparation for the future. Meanwhile, senior Suzannah Carroll says that the project is teaching her patience. For more features, read the May 7 article, Food, entertainment adds lively atmosphere to Cinco de Mayo. Every year, 192 countries set aside a day to demonstrate their support for environmental protection in honor of the world we live on. The Earth Day Network coordinates Earth Day every April 22 in order to raise awareness towards environmental issues and challenges people to change wasteful habits. When asked about the event, sophomore looked up towards the ceiling with a blank expression on his face. Sophomore Alejandro Torres, although familiar with the term ‘Earth Day,’ was not too sure what the purpose of the day was for. Emily Gonzales, ?17, shared the same puzzled expression as Torres?. She maintained an idea of what the event stood for but was ultimately unsure. Daniel Thao, a sophomore at Sanger High School, who also works on his family?s farm, believes Earth Day is a time to remember all the earth has provided for people. Even though the City of Fresno?s Public Utilities Department acknowledges that Fresno is located in an area that has droughts, it appears that people still consume too much water. According to the City of Fresno?s Historical data, Fresno residents consumed 306 gallons of water per capita in 2008. The consumption of water dropped to 240 gallons per capita when water became fully regulated by meters in 2013. Some residents have already taken steps toward living a greener and more environmentally friendly lifestyle. Some steps that can be taken are purchasing Starbucks promotes Fair Trade, which helps local coffee farmers. Purchasing music on an mp3 and getting rid of CD?s is cutting back on wastes. Another helpful action could be starting to plant drought-tolerant plants instead of other plants that require large amounts of water to keep them alive. Small changes like these could help cut back on water usage exponentially. The City of Fresno is putting on a water-wise plant conference at Fresno State?s Greenhouse at Fresno State’s Horticulture Greenhouse, May 3. People can learn, free of charge, on how to better manage their gardens and plants. The Great Pacific Garbage Patch is a reminder that trash does not simply disappear. Millions upon millions of plastic and garbage particles have conjoined together into one massive amount of garbage that drifts around the Pacific Ocean. Though massive, the exact size of the garbage patch is unknown because satellites are unable to examine it due to interference. Though the full size of the garbage patch cannot be measured, people have been able to make estimates according to samples they have taken. Sizes have ranged from 270,000 square miles to 5,800,000 square miles of garbage and marine debris. No country takes responsibility and therefore no funding has gone towards remedying the problem. Science teacher, Dan Harris, believes that caring for and managing the environment is part of a person?s job on this earth. According to the Huffington Post there are at least “17 Ridiculously Easy Things you can do to Help Save the Earth Everyday.” Here are a few helpful tips from the Huffington Post website to be more environmentally friendly. ?Stir your coffee with a dry pasta stick instead of a plastic stirrer that will get tossed after one use. ?Start using a refillable water bottle. In the US alone, 1.5 million barrels of oil are used every year to make disposable plastic bottles. ?Don?t put glass in the trash. It can take over a million years to decompose. For more on environmental awareness, read the April 24 article, Earth Day: Waste your habits away. For more features, read the April 23 article, Annual Sadies gains interest: Join the Discussion. The Feather staff arrived at the Hilton San Diego Bayfront around 1:15pm. The staff of nine students with adviser Greg Stobbe and chaperone Angie Fries, carpooled to the city, April 9. With the group arriving on a Wednesday afternoon, the students had the chance to relax and unwind before the National Scholastic Press Association (NSPA) and the Journalism Education Association (JEA) spring conference. Senior Editor Viviana Hinojosa, Editor-in- Chief Tynin Fries, ’14, and Multimedia Anchor Callista Fries, ’15, will be presenting workshops on how to produce podcasts and how to survive in cyberspace. Though students woke up in the early morning to depart Fresno at 6:30 a.m., most left with smiles on their faces in anticipation for the cool weather and lovely San Diego beaches. But before they could depart for the beaches of San Diego, the boys attending the trip unintentionally destroyed the trunk of Stobbe’s vehicle loading luggage into the back. Eventually arriving at San Diego, the group soon dropped their luggage off in one of the hotel rooms and took the streets in search of food. Students finally settled on The Old Spaghetti Factory and enjoyed classic Italian cuisine. With their hunger sated, the group decided to take to the hotel’s outdoor pool to enjoy the warm sun and the cool breeze. Students had the choice to lay out and soak in the UV rays, wade in the warm pool or to relax in one of two hot tubs. After hours of relaxation at the pool, students decided it was time for dinner. Deciding on Mexican food, the group walked the streets and ventured to La Fiesta for fine Mexican cuisine within the gas lamp district. Finally, students wrapped up the night by walking down 5th Avenue and purchasing miscellaneous goods they set their eyes on and then traveled back to the hotel at 9:30 p.m. Check back for a daily account of the groups activities during the trip or follow the staff’s adventures via Twitter and Instagram through the hashtag: #CoastCoverage. This author can be reached via Twitter: @RRoggenstein. Follow The Feather via Twitter: @thefeather. For more news, read the April 7 article, BRIEF: Spring sport pictures held in FC gym, April 8. In order to gather the funds necessary for their service projects, the Mennonite Central Committee in Fresno hosted the annual West Coast Mennonite Relief Sales and Auction at Fresno Pacific University, April 5-6. People of all ethnic groups and backgrounds came far and wide in support of the relief sales and auction. Volunteers helped in producing traditional Mennonite food, hand-sewn quilts and other merchandise to raise money for the relief of those in pain and peace around the world. Ken Cleyward explains why he enjoys the annual West Coast Mennonite Relief Sales and Auction. Sam Heinricks, a senior in high school, showed less interest in the event then the older generation. Harold Voshage, a senior member in the Mennonite church, explains the purpose of the relief sale and what the money is used for. Angela Mannino, a volunteer at the Mennonite Relief Sales, shares some of the crowd?s favorite meals and treats. One of the must have lunch meals is the famed ?Verenika?. John Alheimer helped to cook the famed dish for the relief sale and explains what Verenika is. Former campus principal, Pat Unruh, has decided to put her administrative abilities to work by helping the MCC gain new recruits. The annual West Coast Mennonite Relief Sales and Auction offers a unique opportunity for those in the community to experience a glimpse Mennonite culture and taste traditional Mennonite cuisine. People who attend will also indirectly help others in need with the purchases they make, as all money made that day will go to help fund the Mennonite Central Committee?s service projects around the world. To better understand to who, and where the money is going, the MCC released a mission statement with their purpose and vision. Should you have an interest in Mennonite culture, or desire taste Mennonite cuisine, or want to help fund relief projects around the world, make sure to visit the festivities next year. For more features, read the April 8 article, Students feel pressure, nerves due to AP exams. The Stanford Achievement Test (SAT-10) has reached the halls and campus classrooms. All students grades 3-11 are to take the exam administered, March 31- April 1. Not to be confused with the SAT or STAR testing, the SAT-10 is a different test used in the United States to measure academic knowledge. 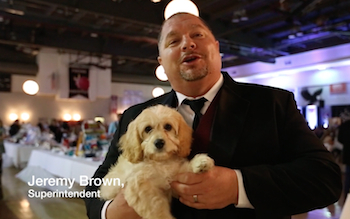 Campus Principal Todd Bennett explains the purpose of this week’s standardized testing. Able to see past the monotony of test taking, junior Joseph Lange sees the value of taking the SAT-10. Shannon Martens, ’11, previously having already taken the tests before, finds the tests unnecessary and incredibly tiring. Freshman, Alejandro Torres, did not know what to think of the test. Michael Fenton, math department head, says that the SAT-10 is a good measuring tool for schools to measure themselves against other schools. Bennett explains why the SAT-10 is necessary for FC and why accreditation is needed by schools to become successful. Students will be tested on Reading Vocabulary, Reading Comprehension, and Science on March 31. Students will take their final tests on Language, Math, and Spelling on April 1. The testing will end around noon. As the highly anticipated Econ Fair finally arrived, students prepared to buy and sell products made by their peers in laughter and cheer. On March 26 students rushed to the FC gym to purchase a variety of different items produces by their fellow classmates. In previous years, the Econ Fair has been held in the FC quad, but due to heavy rain, this year’s Econ Fair was held in the FC gym. Though the location was a major change, the event still ran smoothly. Upon entering the fair one cannot help but notice, the squeaking of shoes in the gym, the eardrum shattering screams and laughs of students as they hustled from stand to stand, purchasing whatever they could, the satisfied faces of store owners after a successful sale and the aroma of crisp money circulating from person to person. Since the purpose of Econ Fair was never explicitly explained to the student body as a whole, many only grasped that it was designed to only sell products to the students. Tyler Breedlove, 16?, scratching his chin and looking off in the distance, formulated his own theory on what the purpose of the Econ Fair was. Sophomore Morgan Miller greatly enjoyed the Econ Fair and looks forward to its return next year. Though the students enjoyed the Econ Fair, it was not without its critics. 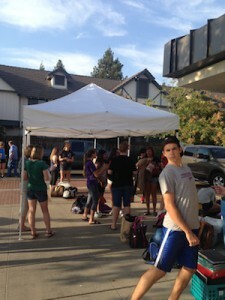 Freshman Triton Seibert showed a stoic and unfeeling expression across his face as he shared his thoughts of the fair. Econ Fair was not a closed off event, it was meant to be shared and experienced with others than just the high school students. Students from junior high were allowed to rush the through the door of the gymnasium and purchase products to their hearts’s content. Not able to contain his glee at the prospect of earning hundreds of dollars working a stand, Austin Duffy, ’18, expressed his love at the idea of earning money after an honest day?s work. Tired, but very satisfied with the money she had earned at the end of the day. Junior, Sara Peterson, recollects her experiences as one of the Econ students selling products the day of the fair. For more features, read the March 25 article, BRIEF: Cheer tryouts approach, March 29. Life in this world is not without pain, stress and depression. When someone tastes these emotions, some can feel overwhelmed, like an ocean of sadness washing over them, which submerges one in dark waters. Regardless of this feeling, people are told to smile, be positive, get over it and to swallow the pain. To stuff the suffering down so deep it will never surface. This is a futile endeavor, which only causes more pain and suffering. Pain and suffering must be addressed directly for any hope of healing. Coping with the pain of depression is difficult. Some seek to numb it by abusing substances, others choose to immerse themselves in work and still others simply want to be left alone to ponder and isolate themselves from the world. However, emotions as strong as these do not disappear. Burying them underneath a false smile and pretending there is not a problem only makes them fester deep down inside. One can only ignore these feelings and emotions for so long, eventually they will surface. My cousin?s wife, Julie, was someone who buried her pain where no one could find it. To my family, Julie was a cowgirl, a strong and willful woman who was not afraid to get her hands dirty and had a smile that could brighten even the darkest of days. She brought a light into any room she walked into. On January 22, 2014, Julie committed suicide. No one in my family saw the ?signs? that she was capable of something like this; no one saw the pain she buried under her smile. Julie?s suicide shook my family?s world and devastated my cousin. In an effort to understand the tragedy I sought after answers. The search led to many different facts, statistics and charts, but this gave no insight into why Julie committed suicide. According to the Official Final Data from the American Association of Suicidology, more than 38,364 men and women committed suicide in the United States in a single year. In 2010, suicide was the 10th leading cause of death among Americans. Homicide, which we see on the news almost every day, was only the 15th leading cause of death in the United States. The most worrisome statistic is that suicide was the third leading cause for people between the age of 10 and 24 years old as stated by the Association of Suicidology, USA Suicide and 2010 Official Final Data. Suicide and depression among teenagers and young adults is abnormally high. It is estimated that one in eight teenagers suffer from depression, making them at risk for suicide. Depression among teenagers typically derives from mood swings, anxiety, stress and the inability to cope with these complex emotions. These emotions typically make the individual want to distance themselves from loved ones. Contrary to the popular myth, suicidal people do not usually want to end their lives, they just want to end the pain. Before committing their final act, they usually reach out in some way to see if there is something worth living for. To those suffering from depression, or those approached by one who is suffering from depression, do not keep quiet about the issue. It is important that all close friends and loved ones be there to support them in their time of need. Depression is rooted in loneliness, to shoulder the pain by oneself is too much to bear. Do not make that mistake. Aside from emotional and spiritual solutions to depression and suicidal thoughts or tendencies, Mehmet Oz, better known as Dr. Oz, a popular authority on medical conditions and problems, offers non-pharmaceutical solutions to help battle depression. Aside from exercise and talking with your doctor about your depression, Mehmet says to lose the addicting sugary foods and to also talk to a therapist to help dispel negative thoughts. Life is not without its difficulties, but it is always something worth living for. Every life is precious, every life is worth something, it is not by chance we came into the world but by fate and purpose. We are human, we will stumble and fall, no one said life was easy. But with our friends by our side we lift each other up and lend a helping hand. All information which I based my thesis, opinions, and general information comes from Teen Suicide, which was edited by Christine Watkins and published by Greenhaven Press. This book contains all of the information I gathered in my article and research. To see national suicide statistics at a glance, check out Centers for Disease Control and Prevention. For more opinions, read the March 17 article, Stroke victim inspires, gives hope for trauma recovery. The FC high school joined hand in hand to serve the Fresno community, March 6. Teachers, faculty members, and students participated service day, piling into busses to assist the community and serve those less fortunate or in need of assistance. During a previous chapel, students were allowed to sign up for a variety of different service projects in the Fresno area. Cleaning up parks and graffiti, assisting at the community gardens, serving neighborhood thrift stores, assisting at rest homes, reading to children, and serving at the Community Food Bank were some of the options available for the students. As students organized themselves into service groups in the FC gym, Journalism Adviser, Greg Stobbe, came in like wrecking ball of enthusiasm. Pumping his fists up in the air and creating catchy cheers. Stobbe perked the students up and made them feel excited to serve their community. Those who went to the Community Food Bank were organized into an assembly line to pack food for a benefit a few weeks away. The availability of food in the valley has become scarce in recent years; it has become even scarcer for children. One out of three children in the central valley struggles with hunger. Sarah Pedelty, the Volunteer Coordinator at the Community Food Bank, felt called to serve the people struggling with hunger in the valley. Alejandro Torres,?16, loved his job in the assembly line and knowing that his work was going to help those less fortunate. Pedelty greatly appreciated the service the students provided at the Food Bank and noted that it could not help the community without volunteers. Students also went to out into the community to help businesses struggling in the recession. Bryan Feil, manger of a local thrift shop, was very pleased with the service the students provided for the business. Brooke Wood enjoyed the service she gave to the thrift shop and thinks that it will help in promoting future business for the local shop. The streets of Fresno have seen much graffiti in their time. Junior Bryant Nguyen took part in painting over the graffiti on the railroad tracks near Ashlan and West. Though all students were eager to help, some felt slightly cheated out of the service that they signed up for. Jennifer King, 14?, did not expect the change in service at the elementary schools. English teacher, Amy Deffenbacher, experienced a similar change at her site, the New Life for Girls. At the end of the service day students enjoyed the change in the monotonous school hours and have the chance to go out and serve their community. Torres enjoyed his service to the Community Food Bank and is thankful for the chance to serve. For more features, read the March 6 article Drama to perform ‘Bye Bye Birdie,’ make history (VIDEO). The drama department is about to make FC history by producing the first ever musical. The class has decided to perform Bye Bye Birdie with an added bonus of a live orchestra. The high school drama class will be performing Bye Bye Birdie, March 7 and 8 at 7 p.m. and March 9 at 4 p.m. The performance will be in the Peoples Church Student Ministries Center (Ground Zero). The production will have added value of a live orchestra to play for all the musical numbers. Senior Natalie Ruiz, gives insight on what it is like to act with a live orchestra. This is the biggest challenge the drama class has ever undertaken. With such a difficult play, comes challenging roles, and senior Robbie Hill takes on the lead for this year’s play. This being his last year on campus, he hopes to be able to impress the crowd, and make it the best play in the school’s history. Hill will play the role of Albert Peterson, which is the leading male role. 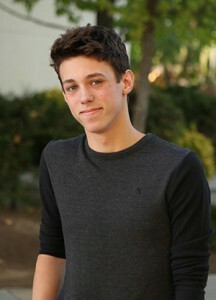 He is confident in his ability and is glad to be challenged by the complexity of a musical. Drama Director Susan Ainley has considered doing a musical for many years. The number of drama students this year made it possible for her to pursue her goal. She chose Bye-Bye Birdie for its lovable plot and lively music. Timothy Nyberg, ’16, is excited to see history being made. After watching a snippet of the musical during a Tuesday chapel, he looks forward to seeing the entire production. Ainley anticipates a spectacular performance from her drama students and is eager to see the senior students try something new in their last semester of drama class. She encourages the FC community to join the audience. Tickets are $10 for adults and $5 for students, seniors and military. For more features, read the March 5 article, Orchestra aids drama department in first musical. The purpose of the Congress of Future Medical Leaders is to see advancement and enrichment in high-achieving students with an interest in the field of medicine. During the middle of the winter, the Congress of Future Medical Leaders congregated at the Washington D.C. Armory to learn about new, exciting advancements in the world of medicine. The National Academy of Future Physicians sponsor the Congress of Future Medical Leaders; the Master of Ceremonies (MC), Richard Rossi founded both of these enrichment programs. The purpose of the Congress of Future Medical Leaders is self-explanatory: The advancement and enrichment in high-achieving students with an interest in the field of medicine. Though the intricacies and details of the selection process are not given, the minimum standards for a student to be selected is to have a GPA of at least 3.5 and a recommendation from a teacher or an advisor. Students must fly themselves and find their own housing once they arrived at the capital, and to be ready for the opening ceremonies, Feb. 14. Upon arriving at the Armory, students and scholars are peeled away from the grasp of their parents or guardians and escorted to security terminals. 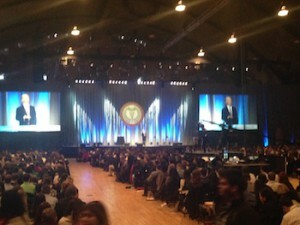 Once through security, students were allowed to enter the Armory itself and find a seat among thousands of strangers to hear the opening remarks by Rossi. Rossi started the conference by acknowledging the students for their academic and achievement and stated that they are the future of the medical world. He stated that he did not want this to be like any other conference the students have attended before, and made a peculiar plea to the students. The scholars were hesitant at first, but soon everyone was hugging and embracing each other. A sense of family and familiarity filled the once cold armory. After the opening remarks students were informed that they would be able to hear from, and eventually speak to leaders in medicine and medical business. Nobel Prize winners, medical prodigies, marvels of the medical world, and business owners with the key to success and happiness were among these speakers. The most notable advice came from the two Nobel Prize winners, Jack Szostak and Mario Capecchi. Both stated the science is an ever-changing thing, and that nothing is written in stone. Students alleged grateful for their gifts and their opportunity to attend the conference, but mix of melancholy and purpose overcame the room. Leaving newfound friends to pursue greater aspirations elsewhere created a bittersweet moment as students left the armory. Most students were, nonetheless, grateful for the opportunity to attend the conference. For more news, check out the Feb. 25 article Four-star app provides helpful aid to students. As the new year begins, new talent surfaces and demands our full attention. The campus Music Department offers this new talent in abundance. Isabel Kim-Feng, ’18, demonstrates a passion and a desire for her music and craft that is often rare to find in such a young student. Kim-Feng came to the doors of FC as a sixth grader and joined the small elementary choir. As she matured, her tastes of music did as well. Joining the Intro Worship Team has allowed Kim-Feng to further diversify her talents and improve herself to an even greater extent. Scrambled and confused about what she will choose, Kim-Feng answers the difficult question of which instrument she prefers. Despite the confusion of her favorite instrument, Kim-Feng shows a great deal of focus and determination not typically seen in an average junior high student or high school student. Dreams of becoming a worship leader did not simply manifest over night. Watching, learning and admiring past performers makes dormant passions come to life. Kim-Feng?s aspirations, focus and passion have been made abundantly clear, so clear it is hard not to take notice. Music Director, Michael Ogdon, has noticed such fiery passion in the young junior high student. Though Kim-Feng has shown great promise and an incredible amount of growth in her young life, Odgon notices there can be room for improvement. For more features, read the Jan. 21 article, Resource bar: One-stop shop offers students support. Kenya, the home of the Great Rift Valley and birthplace of President Obama’s father, has received much media hype and attention in the past year of 2013. With terrorist attacks organized by the Al Shabaab in Nairobi (the capital city), and visible anger among the population, the few days I spent in Nairobi were a bit shocking; if not terrifying. On the night I arrived the first thing I noticed was that there were four, expressionless men dawning red berets and holding machine guns at the entrance of the hotel. My family and I were taken from the car and brought to the front of the hotel where we were then frisked for any firearms. Confused and bewildered, I asked one of the hotel security guards why there were men with machine guns standing guard at a hotel. Very calmly, as if this was just an everyday occurrence, the guard told me that there had been a riot no less then a block away from the hotel a few hours before my family?s arrival. My jaw dropped when I heard news of the riot. The streets were so quiet I could hardly believe that a riot had just happened. The guard reassured me that there was a fight among students at the local university and the police, things got out of hand, and a policeman panicked and killed one of the students. The guard then told me that the student who was killed was actually a nephew of his. There were no tears of sadness trickling down his face; no anger filled speech, this man remained completely calm and completely expressionless. He simply reassured my family and I that we were safe and that the justice system would not fail. Though my family?s stay in Nairobi was supposed to be our last chance to relax before starting our work in a small village, we were in for a rude awakening. The tension among the people on the street was so thick a person could cut it with a butter knife. Anytime we wanted to leave the hotel, even if it was for a stroll to a nearby ATM, security was required to follow us. We bunkered down in our room for the most part during our stay in Nairobi. As I sat down in our room, I began to think of what I was thankful for in America. Though our country has her faults, and by no means is America the perfect country, she has been able to secure the safety of her public better then most countries. Most American?s do not live in fear that they will be caught up in violent riots, most of us do not live in fear of being shot down by the police in the middle of the street, most of us do not live each day as though it might be our last. My time in Nairobi humbled me greatly. I often find myself ranting and complaining about petty problems that amount to nothing. If this trip has taught me anything, it is that life is too short to always be negative. As the new year starts I will try to be more thankful for the things that I have. For more opinions, read the Dec. 17 article, Senior reflects on learning experience, journalism. Though this event served the people hot chocolate and holiday cheer, it also served another purpose. Fresno’s very own Rockabilly Mafia Dolls, as a benefit for the Marjaree Mason Center, hosted the Rock-N-Roll Around the Christmas Tree, Dec. 6. In the darkness of the night, during the bone chilling cold of winter, in a small building concealed in the shadows of the Fresno fairgrounds, a tiny light shown through. Even in the midst of the cold and darkness of this winter night, the light invited all people to come and enjoy themselves among the company of others, in a warm, safe, and fun environment. As rock songs played in the background of this warehouse setting, one could faintly hear the warm laughter of others, could see the joy in the smiles of the people and a presence of togetherness and unity possessed the dwelling. Everyone, young and old, enjoyed the simple pleasure of roller-skating together on the hard cement floor, and the taste of hot chocolate still fresh on their lips. Though this event served the people hot chocolate and holiday cheer, it also served another purpose. Fresno’s very own Rockabilly Mafia Dolls, as a benefit for the Marjaree Mason Center, hosted the Rock-N-Roll Around the Christmas Tree, Dec. 6. The Marjaree Mason Center’s goal is to help put an end to domestic violence (violence in the home) and to help provide housing, legal support services and counseling. Vanessa Garcia, with the Rockabilly Mafia Dolls, helped put on the benefit for the Marjaree Mason Center as a way of saying thank you for their aid to the community. This idea of family fun and togetherness, with the purpose of helping those who cannot help themselves, has the potential of becoming a holiday tradition here in Fresno. Hopefully we will all see the return of the Rockabilly Mafia Dolls and their Rock-N-Roll Christmas next year and for years to come. This writer can be reached via Twitter: @RRoggenstein. Follow The Feather via Twitter @thefeather, Instagram @thefeatheronline and Facebook @thefeatheronline. For more news, read the Dec. 18 article, BREAKING: CSPA names Feather Crown Finalist. Throughout his tenure as President of the United States,Barack Obama has promised to bring change to America. His promise of change has finally come to fruition with the passage of the Affordable Care Act (ACA or Obamacare). The new bill was passed, March 23, 2010. This new piece of legislation, and those who passed it, promised to change the American healthcare system, and they have not fallen short on that promise. ACA is perhaps one of the most controversial, lengthy and confusing pieces of legislature that has been passed in the history of the United States. The former Speaker of the House, Nancy Pelosi herself said, “We need to pass it to know what?s in it.” Indeed, the proposed bill itself numbered approximately 2400-2700 pages long, making it nearly impossible to comprehend the new law fully. Regardless of the controversy and length of the ACA, it has made some long overdue reforms to America?s old healthcare system. Obamacare has promised to extend healthcare to the 40 million Americans who could not originally access it, such as: the poor, people with pre-existing conditions and the young people. The reforms and revisions Obamacare made have been necessary and long overdue in America. No one should be denied healthcare for having a “pre-existing condition.” However, the way in which these reforms have been implemented is less then satisfactory. The new standards for healthcare that are now being enforced by the ACA have resulted in the termination of about 5 million plans for Americans in the individual-markets. These plans have been canceled because they did not meet Obamacare?s standard for health, even though the people who had these plans liked them. President Obama?s promise of “If you like your plan you can keep it” was not true, and has resulted in severe media scrutiny. These people who have been forced off of their plan will be in a period of transition. They will have to get new, higher cost plans, covering things they don?t need to be covered, or want covered. For instance, older couples will have to pay for maternity coverage whether they want it or not. Younger people have to pay for mental health coverage. whether they want to or not. The reason why these people have to pay for things they don?t want or need is to help pay for those who do need the coverage. The best way to explain it is that everyone chips in and buys coverage they don?t need to help pay for those who want that coverage. Except people aren?t really ?chipping in?, they?re being forced to pay for it. On top of people losing their plans, most people have been unable to access the government website to sign up for Obamacare. On the first day six people signed up for new healthcare plans, that number has slowly increased each day. Ironically, ACA resulted in people losing their healthcare coverage instead of people gaining affordable coverage. The exact amount of people who have signed up for Obamacare is not exactly known. The Obama administration has released some questionable records on how many people have joined. It is said by the Health and Human Services (HHS) that 106,000 have signed up for the Obamacare exchanges. It is very slow progress, because the goal was to have 40 million people signed up by the end of the year. Aside from the technical failure of the website, there have been a variety of security risks. A group of white hat hackers were hired to hack into the website and test its security. They found the site easy to crack into, and being able to view users phone numbers, emails, usernames, passwords, even their locations. Anyone on the Obamacare website does have their security at risk. It is unknown how long it will take to fix the website. David Kennedy, one of the hackers, said,” It’s really hard to go back and fix the security around it because security wasn’t built into it,”. Kennedy mentions that it will take multiple months to over a year to at least address some of the critical-to-high exposures on the website itself. Though the ACA promised great things for healthcare reform, its implementation and execution of the tasks at hand have been too unsatisfactory. The law and website will need considerable revisions and adjustments to meet the bare minimum. Whether the site and law should be shutdown completely and everyone should start from scratch is up to debate among our lawmakers. Hopefully, whatever course of action they take is for the best. Make sure to do your own research on the ACA. This law can affect you in a variety of ways, it would be unwise to not see how it affects you. If you want to check out my primary source for information on the ACA, look up The Kelly File watch the show, Wednesdays at 9 p.m.
For more opinions, read the Nov. 26 article, President encourages thankfulness, community involvement. Common Core, a new standard for education, is rapidly sweeping through the nation. The new standards offer a clear understanding of what relevant skills students need to operate in the real world. With these standards for education, some journalism or publications classes are being cut, as they are not considered a “core class.” But journalism offers skills that are completely relevant to the real world. Journalism is one of the few classes to offer actual, real life skills that are beneficial to anyone, and everyone looking for a steady, well-paying job. From teaching critical writing skills, to the in’s and out’s of social media, to analyzing important and relevant information, to working with a team; this class offers knowledge that students cannot simply learn in one of their mandatory classes. Besides offering real life skills to students who take journalism, the class also offers an excellent opportunity to build up student resumes for college. Most colleges require a sample of a student’s writing before they admit the student to their campus. Journalism takes care of this requirement. All students in the class are given the opportunity to write dozens of articles and papers for the school newspaper. Colleges can review articles written by students to fulfill their need for a writing sample. Some may hate to hear this, but writing, and more importantly, critical writing is a growing necessity in the world. All well-paying, white-collar jobs do require a writing skill of some sort. The only jobs that do not require any writing abilities are very low-paying, physical labor jobs. Journalism helps students with their writing skills by allowing them to write and produce articles that are then peer edited. This process allows students to learn from their writing mistakes, correct their mistakes, and then makes sure they will not make the same mistake again. Practice makes perfect. On top of writing skills, journalism also offers the unique opportunity for students to use, and practice with social media. This skill is also a growing necessity in the world. Everyone in last decade has developed a growing need to be connected to everyone, even strangers, through a virtual screen. Jobs and colleges are beginning to accommodate this need by integrating their technologies and systems with social media. Corporations have started their own accounts on various social media websites to increase their own publicity. A young person who knows how to properly utilize social media would be considered invaluable to corporations that thrive on popularity. Colleges have also taken steps towards using social media. Assignments have changed from writing paper essays to making podcasts, videos and blogs. To someone who has not made a video, a podcast or a blog, this transition could prove frightening. Luckily, journalism already requires students to use a social media network (either Facebook or Twitter) and use it regularly for a grade. Videos, podcasts and blogs need to be created to maintain a good grade in campus journalism as well. Students who participate in the school newspaper will be three steps ahead of everyone who has not. Critical writing, social media use, video and podcast productions are just some of the many important skills journalism teaches its students. The most important skill this class can teach its student is what its like to work in at a actual job. Listen to my podcast if you want to learn how the school newspaper is like a job, why I decided to take the class and how it has benefitted me. Make sure to listen to Tynin’s podcast on the new Common Core standards and how it is affecting journalism students everywhere. Check out websites like Inside MC and Bismark Schools to learn more about why you should take journalism. Worship team teacher, David Martens, had the pleasure of attending the National Worship Leaders Conferencein California, Oct. 7-9. The conference took place at Ocean Hills Church in San Juan Capistrano, CA. Those who attended the event had the privilege of attending a number of different sessions and meetings designed to encourage and aid worship leaders in improving the quality of their worship. Martens has always had a deep passion for worshipping the Lord, and is glad he had the opportunity to attend the conference. The conference not only encouraged and aided worship leaders, it showed them new ways in how to look at worship and faith. Martens was introduced to the conference by one of his own worship team leaders, senior Natalie Ruiz. Ruiz found the experience very enriching and full of great lessons for everyone that attended the conference. Ruiz’s favorite part about the conference was bonding with the worship team at her church. There were many lessons that could be learned at the conference, but one in particular stood really spoke to Ruiz. To learn more about the conference make sure to visit the website. 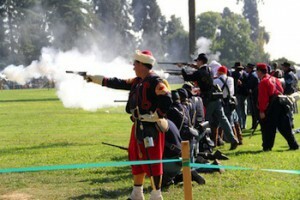 The Fresno Historical Society is hosting a reenactment: the 24th Civil War Revisited, at Kearney Park, Oct. 19-20. The Civil War: The bloodiest war ever fought in American history, pitted brother against brother, family against family, friend against friend. Entire families were torn apart over political differences, and then killed each other on the battlefield over their principles. America has never seen a war of this magnitude before. To remember the 150th anniversary of the third year of the Civil War, The Fresno Historical Society is hosting a reenactment: the 24th Civil War Revisited, at Kearney Park, Oct. 19-20. The actors are reenacting the turning point battle, the Battle of Gettysburg, which occurred between July 1-3 in 1863. The reenactment serves as a reminder for the lives lost to restore the union of the US. May the sacrifices of the men who died in battle remind us to not let a dispute come so far that we must wage war against our brothers. Actor, Bill Peck of Los Angeles, will be portraying the 16th President of the US, Abraham Lincoln. After the Battle of Gettysburg, Lincoln will recite one of his most historic speeches, the Gettysburg Address at 2 p.m., Oct. 19. History teacher, Kori Friesen, expects that the reenactment will come as close to reality as possible. Friesen is offering extra credit to incentivize her U.S. history students to attend the event. The characters played by actors are not just hollow shells of information. They also have entire backstories and past?s students can ask about. Senior Ryan Stewart, having been a part of the reenactment for many years now, is playing the part of a Confederate soldier and will fire a canon on the field. Visitors can find him in the Confederate camp under a green flag. With a smile appearing on his face, Stewart remembers and gives details on one of his favorite characters he has played. Event spokeswoman, Cindy Wathen, also encourages everyone to attend the reenactment for the start of a new tradition that will hopefully last for years to come. In the wake of new traditions, old ones are taking their leave and saying goodbye. Peck, who has been playing the role of Lincoln at the reenactment for years, will finish his role with his delivery of the Gettysburg Address after the reenactment of the Battle of Gettysburg. For history enthusiasts there will be a dinner and a ball, Oct. 19. Those interested in attending the event have to pay, but it includes getting to eat with, dance with, and sleep underneath the stars with the people portraying the soldiers who lived in the time of the Civil War. The battle for Gettysburg begins at 1 p.m. and again at 5 p.m., Oct. 19. The battle will be reenacted again at 1 p.m., Oct. 20. Entrance to Kearney Park for the event is $15 for adults, $8 for children (ages 6-12) and free for ages 5 and under. Parking coupons are available through Friesen or the high school office. The reenactment is sponsored and presented by the Fresno Historical Society. For more information on the schedule, visit www.valleyhistory.org or call the Historical Society at 559.441.0862. For more news, read the Oct. 14 article, Choral department holds first performance. On Oct 1, 2013, the United States federal government entered in to a partial shutdown of all non-essential government personal. Hundreds of thousands of Americans will be directly affected, 800,000 workers have already been forced on furlough (a forced leave of absence without pay until the government reopens) and another 1.3 million others are required to, by law, to perform their jobs without pay. There is no exact science behind who gets furloughed during a shutdown and who does not. Each agency of the government decides that for themselves, based on a general opinion of Jimmy Carter?s attorney general of 1980, which is, ?anyone involved in protecting life and property works.? In the government shutdown of 1995-1996 a House sub-committee convened a council to try and decide which parts of the government are considered essential and non-essential, but they never reached a conclusive answer. As to the council?s failure to decide which parts of government are considered essential. Our leaders must now decide which parts of government must remain active based on an opinion from an attorney general that was given more then thirty years ago. Americans are lucky that the government does not provide most of the services and products they consider to be essential to their way of life. Food, water, and Internet access will remain untouched during the shutdown, as most of these services are provided by private enterprises, not the government. Though a government shutdown is serious, it is not as terrifying as the media tends to portray it. Immediate affects of the shutdown are that financial regulators, tax collectors, some social programs, parks and museums will not be funded; therefore they will not be able to operate. Schools, sadly, will remain open as most of their funding does not come from the government. Students will continue on through their studies, even in the midst of a shutdown. The reason why the shutdown was initiated was that congress was unable to approve a budget by the deadline, in large part to the Republican Party’s inaction. Republican and democrats are currently negotiating on the budget, and republicans have already caved in on the main reason they started this shutdown. Listen to my podcast to learn more about why the government shutdown happened and what our house leaders are negotiating about. For further information on who decides who is essential during a shutdown and who is not, see The Fresno Bee, October 10, 2013 pg. A12. Remember to avoid biased websites that churn hysterical, and untrue stories that are designed to strike fear and panic into the public. Such as Wall Street Daily. Front featured photo credited to John Sonderman via Creative Commons 3.0. For more opinions, read the Oct. 11 article, Journalism offers media advancements, skills. As the Tour de France encroaches ever closer, former FC student Jack Maddux dreams of one day riding along side the pros. At the young age of 16, he has already achieved much as a cyclist. Already on the US Junior National Team, Maddux is only limited by how far he can dream. Maddux, even through his younger years has loved biking. This love and passion for the sport further fuels the flames of his ambitions. Allegra Maddux, Jack?s mother, recognizes and praises Jack?s determination and drive. A common misconception is that biking is an individual sport, but that is not the case. Biking is a team effort, the team and the individual share a symbiotic relationship, and one cannot survive without the other. Dave Maddux, Jack?s father, realizes the relationship between team and individual, and is glad his son possesses a strong loyalty to team. Jack?s coach, Felicia Gomez, evaluates his character and determines that Jack has the heart of a true champion. Jack?s skill, and love for the sport has taken him all the way to US Junior National Team for biking. He considers himself very privileged to be able to participate with them for two excursions. The sky is the limit for this young cyclist. With his skills and determination, Jack?s dreams are not far from reach. Such dreams, no matter the skill and caliber of the one who dreams them, requires sacrifice. Jack decided to start taking online classes and schooling to give himself more time to train. Jack?s parents were hesitant at first, but they have warmed up to the idea of online schooling. Even though Jack left FC, he left impressions on some of the people that still attend the school. Senior, Dustin Swain remembers Jack fondly. In pursuit of his dream to become a professional cyclist, Jack gets ready to leave for Europe to ride for the US. As Jack rides to bring pride and glory for his team and the US, he has the undying support of his teammates, family and friends backing him every bit of the way. For more features, read the Oct. 4 article, Spectators engage in Big Fresno Fair attractions. On Aug. 16, 2013 in Duncan Oklahoma, Australian Baseball player, Christopher Lane, jogged through the warm Oklahoma sun without a care or fear in the world. Unbeknownst to him, these would be his last few breathing moments. Lane was targeted for a random drive-by shooting, and was gunned down in the middle of the streets of Duncan. Chancey Luna, 16, James Edwards Jr., 15 and Michael Jones, 17, are being held in the Stephens county jail for murdering Lane. The young criminals are being tried as adults for first-degree murder charges and accessory to first-degree murder. The individuals accused of Lane?s death are unrepentant. When asked why they targeted and murdered Lane, they responded, ?We were bored.? When I read about what happened to Lane I was appalled, and disgusted with the actions of these young thugs, but not surprised. The culture of America is deteriorating at a rapid pace. Our morals and ethics have evaporated into thin air, practically invisible. Each day I hear of more shootings, more killings and more bodies hitting the hard pavement. Theft and robbery have become a part of life, it is just what happens to you if you leave your car door open, or your house door unlocked. No one sleeps in his or her bed at night without fear of being broken into anymore, our cities and towns have become too dangerous to trust anyone, let alone leave our doors open. What has happened to our nation? Where did we go wrong? When did we allow depravity, sin and crime to run rampant through our streets? Many would attribute this rise in criminal activity to the hemorrhaging economy. Without money or a job, people turn to crime in order to make ends meet. Sadly, it is not as simple as pointing a finger at the economy, the problem lies deeper within. The reason why America?s morals and ethics have all but been obliterated is idle hands, lack of family values and absence of faith in God. Without work, without a proper family, without a faith in God, without these things people lose their reason for existing. When we lose our way, when we lose our reason to live, we do anything to find some purpose, some meaning to our lives, something to fill that void. In the case of the young criminals, they turned to crime to fill the void in their hearts. Their idle hands, their lack of family values and their absence of faith turned them and warped them into monsters. The only way we can reverse our rapidly deteriorating morality is to return to a life of constructive work, family, a faith and truth to devote our lives to. With good family values we learn to discern between right and wrong, good and evil. With busy lives we find a purpose for living, and keep our minds sharpened and on task. With faith we find the ultimate reason for existence. Without faith in God everything else falls apart. Without him we lose our purpose, our way, our life, everything. We must turn our backs to the ways of this world, return to God, the rest will follow after we return to him. If you are a high school student and reading this, you may think, “Well how does this affect me? I don?t live in Duncan; I don?t even live in Oklahoma. How could this one murder possibly mean anything to me?? Whether you like it or not it does affect you. When people our age or younger go out and start killing others just to ease their boredom what does that say about us as a generation? The burden is on our shoulders as well. We cannot let murder and mayhem and this savagery define us as a generation. The choice is yours. Will you conform to this world, and sink into its bottomless pit of filth? Or will you rise above it, and be transformed into a beautiful, new complete being? Rise or fall, its up to you. For more opinions, read the Sept. 20 article, President reminisces campus highlights. “Hey, I just met you, and this is crazy, but here’s my number, so call me, maybe?” The locker room echoes to the tune of “Call Me Maybe” as players hone their vocal skills and make jokes with two new freshmen players, Thomas Friesen, No. 40, and Julian Castro, No. 9. The grand debuts of these future pop stars began in the heat of June. But Castro and Friesen are not the only rising freshmen stars on the varsity team. Sage Sobrado, Timothy Melendez, Daniel Aryes, Matthew Tanaka and Slater Wade are also fellow freshmen players. Castro finds the locker room singing experience hilarious to watch and also a good way to bond as team. Even before the locker room pop star performances; Castro always had a great love for football and a real passion for the sport. Castro decided in fourth grade that he wanted to join the campus peewee team, and has played football every year since then. With a twinkle in his eye and a large smile across his face, Friesen reflects on why he loves football so much. Castro has played football for many years, and throughout all those years, only one person comes to mind as his key mentor: his father. Castro has many fond football memories, but his favorite memory so far was his first touchdown during his first year of peewee football. While football can be a wonderful team experience, it is also a physically demanding sport, which sometimes results in personal injury. Friesen knows first hand of these consequences. In light of these challenges, senior Grant Flamming recognizes the strength?s of the new freshmen. He also offers some advice to his teammates, encouraging them to work hard on the field. Head football coach, and Athletic Director Mick Fuller, after careful observation of these two freshman?s characters, foresees that they will become capable leaders. FC football players have their first home game on Sept. 13 at the FC stadium. Support the Eagles as they fend off against Vacaville Christian High School, beginning at 7 p.m.
For more sports, read the Sept. 9 article, Cross country sports shorts: Highlander Invitational.